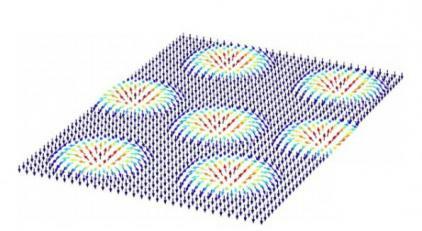 Researchers from Singapore's A*STAR and NTU developed a tunable room-temperature platform that can be used to control and detect magnetic skyrmions. This platform is actually a thin film made from multi-layer stacks of Ir/Fe/Co/Pt. In this material, the magnetic interactions governing skyrmion properties can be controlled by varying the ferromagnetic layer composition. The skyrmions exhibit a smooth crossover between isolated (metastable) and disordered lattice configurations across samples, while their size and density can be tuned by factors of two and ten, respectively.